Kenneth John Atchity, Ph.D. is brilliant. His new novel, The Messiah Matrix, is a compelling story that may challenge readers to view religion differently. Within the first two pages, I was hooked. The murder of the monsignor, the confession of one stranger, the diving expedition that uncovered a hidden and valuable artifact–every event spun part of the mystery into a web that wasn’t easy to unravel and exercised my brain muscles; it’s a cerebral experience, not just great entertainment. The writing transports the reader into a fictional drama with international flavor, and artfully educates. The sexual energy grows between the characters of Ryan and Emily and while fighting his attraction for Emily, the reader senses Father Ryan’s torment and confusion. All the while, the reader is immersed in Roman history and the ancient story of Augustus, sometimes told in a flash back style, through Emily’s character sharing stories told to her by the late Monsignor. The two travel together and slowly connect the unconnected to explain the origin of Jesus. Their revelations are not welcomed by the Catholic Church in Rome and put them in great danger. After a daring escape from the caves of Cumae, they are able to reveal the truth about the true “Christian Savior” and the reader may be surprised by the story’s ending. Only Ken Atchity, who has expert knowledge of Christian history and classical training, can pull off scholarly work that reads like a fascinating, dramatic adventure, meant for the silver screen. It is a controversial subject and some Catholics may be startled or surprised by what the author’s research revealed. I know I was. Brought up by strict Catholic parents and taught by the Jesuits at Boston College, I am a traditional believer; Yet during the reading of The Messiah Matrix, I had moments of doubt: “Could it be that what I had learned as a child wasn’t true?” Atchity’s fact-finding is that compelling! A matrix is defined as "A situation or surrounding substance within which something else originates, develops, or is contained." Within the pages of this intricate novel we learn about the origins of situations in the past the have reflected themselves in the present as the author takes us back in time to 70A.D. when Flavius Josephus the Historian decided to add 100 words that would change the course of history and the perspective on the existence of one man who was and still is crucial to the Church and Christianity, Christ. Did he really exist? Why is that so many scholars, writers never make mention to actually seeing Jesus in person. Those investigating this issue found one physical reference in a document titled: Testimonium Flavianum added to an edition of his book: Josephus' Antiquities of the Jews, where he makes mention of his existence. Antiquities 18.3.3. "Now there was about this time Jesus, a wise man, if it be lawful to call him a man, for he was a doer of wonderful works, a teacher of such men as receive the truth with pleasure. He drew over to him both many of the Jews, and many of the Gentiles. He was the Christ; and when Pilate, at the suggestion of the principal men amongst us, had condemned him to the cross, those that loved him at the first did not forsake him, for he appeared to them alive again the third day, as the divine prophets had foretold these and ten thousand other wonderful things concerning him; and the tribe of Christians, so named from him, are not extinct to this day." According to history Pilate condemned him to be crucified and to his death. Some who became his disciples did not abandon him. Some reported that he appeared three days after he was crucified and he was the Messiah. But, our novel begins with the murder of a Monsignor authorized we are told by the Holy Mother Church as related by his killer who seeks redemption from Father Ryan and absolution for his sins. But, no sooner does the young Priest begin speaking to him in the Confessional, this man runs out of the church and finds himself the next victim. Why was he sent? Why would the Holy Mother Church order the death of this great man and what do the final words of the killer mean? Diving in the ancient Harbor in Israel, Emily, an archeologist and her team are diving below the surface and encounter some rough waters. Hidden below the surface in a boat that has been there for many years is a treasure that will change the course of many lives and endanger those that found it. Two of her student divers remain below the surface during this dangerous storm causing Emily to have to find out their fate. Diving, searching and finally learning the reason why their rise to the surface was delayed she decides to complete what they started. Beneath and stuck in a krater was a gold coin. But, not just any gold coin one that was enveloped in bronze by its first owner who left it there thinking he might return for it at a later date but never did. "The Augustan Aureus: never released, was sitting in the palm of her hands." The author vividly describes the coin: the figure portrayed is wearing a crown that appears to look like thorns. His face has a beard and the thorns look like a halo of spikes differing from the coin depicted on the cover of this book. Within the coin the creator inscribed: Chi and Rho, Greek Letters. The discussion was exciting and heated between Emily and her two students as the history behind the coin is revealed, their excitement palpable and the need to protect the coin noted. Meeting a man named Luke who Emily feels might provide more answers and perhaps funding for her team to continue their research in this field. Father Ryan relates his meeting with our late Monsignor and the fact he too was in search of answers regarding Christ and his existence. Throughout Chapter 10 he relates what he learned about the man, the many scholars who published documents back then but never mentioned seeing Jesus in person and determining how to handle the fact that the killer, an Albanian man died in his arms and whether he should report it. The chapter relates information about Herod, the slaughter of male infants and the rumor of a royal birth. It continues with his meetings with the Monsignor, his lifestyle and wondering what he might have found in the Sibyl's cave that got him killed. Three separate plots: two murders, a coin that could change it all and a Priest that wants to find the connection between the death of the clergyman and the secret he might have buried with him. The Messiah Matrix will hopefully answer this question, leave readers asking more of their own and hopefully enlighten everyone about the research and the history related to Jesus and his existence. Getting to understand Father Ryan we learn just what a threat he seems to be to the Vatican when summoned to the office of the Procurator General of the Society of Jesus and we hear his tone, his threats to Ryan and the end result in being attacked, entombed when looking at the sarcophagus of St. Paul and then bumping into Emily and finding out it is the Bishop and many attached to the Jesuits that are involved. Followed, shot at, attacked and learning the name of the bishop behind it all is not even the tip of the iceberg for these two when they team up to find out what caused someone kill Oscar Isaac their beloved Monsignor. The book is replete in history and the Monsignor found a link between Jesus and Augustus, which is explained in detail. Next, the cameo of the Emperor Augustus with a crown and holding the royal Roman Scepter carved they think during the time Christ was depicted on the center of the holy cross. This cameo was said to mean that the emperor was the "earthly representative of the almighty power of God." He was also hoping to find the coin that Emily recovered and he thought his research important for the "origins of Christianity," dangerous to the church and the Vatican. Finding the coin that was so valuable and the events that followed alerted Ryan to why he had to fear Pimental the Procurator. But, there is much more as the man who cleaned the coin, translated the words for the one person she thought she could trust but not only stole it from her but intended to capitalize on it, realized that on the coin in Greek were the words: God and son of god embossed across from the name: Jasius Augustus. As you read this novel many different viewpoints come to light regarding Jesus as the Son of God and the Roman Emperor Augustus thought to be the real Son of God according to the Monsignor's research. If this is true and he is said to be son of god then the Christian Savior should be considered even more a Son of God which explains the tension that mounts within this novel between the Christian church, the Jesuits and the conflict that Father Ryan and Emily face as they come in contact with those that are behind the events that almost took their lives and did take the lives of three others. The Antiquities of the Jews and the crown that was worn by Apollo and the evidence found in the cave and presented to them will give every reader pause for thought, reason to do the research into what is presented themselves and make your own final decision. The cult of Augustus was "reinstated by Constantine," and revived in the present. In other words Augustus had "designated a dozen of his pontiffs as August ales, to spread the rubrics of his cult throughout the empire." In reality what Emily and the Monsignor uncovered is from what is depicted on her coin: the bearded image of Augustus wearing the Crown of Thorns- standing for the golden spiked one worn by Apollo. In reality when they asses what they have found, rendered all of the information in the files found in the catacombs and more the end result is that Isaac surmised that : Jesus was Augustus and Ryan has been asked to continue on with his work called the Messiah Matrix. Was Jesus a real person? From the research presented within this novel the author relates that Augustus founded Christianity. The story created by Pimental and the Bishop would change the course of history. Stating that the imperial cult of Augustus Caesar was Christianity in itself. As we hear Pimental and Emily speak and the research of the Monsignor revealed we learn what others believe to be the truth: that Jesus Christ was " simply the imperial cult name for the deified Caesar Augustus and the Church Fathers would later spin the manufactured mythology to create a literal biblical Jesus." When the truth as they tell it unfolds the answers reflect that a mythology emerged into religious power and housed itself with the guardians and those who related the what they thought the real version of religion. Temptations rise, lives are placed in danger as Emily and Ryan face the challenge of their lives but first they have to escape what has been planned for them by those that appear to want them to submit to their will. A final scene will make readers hold their breath as Emily and Ryan are sent head first into a boiling underground river and hope to emerge unscathed. Characters that are quite interesting and a storyline you will have decide for yourself whether you believe or not. As you read the final chapters and hear the voices from the past of the Emperors, Virgil as he is honored and allowed to sit with the Emperor. What is truth and what did they decide to recreate and change you will have to read and hear the voices of Virgil, Augustus and those in attendance to find out. Creating a cult, which would unify the people of the empire and bring peace. A document or book that would relate the facts and events the way they had conceived them making one man the true God in the eyes of the people. When Ryan and Emily present their findings and you read the last chapter and the chart they created of the events from start to finish, you the reader will decide: Was the real Jesus the one born in a manger or was Jesus: Jesus Augustus? You decide after reading this outstanding novel whose research and an ending that will bring it all full circle. Pros: Excellent historical detail, interesting intrigue built into plot, very similar to "The Da Vinci Code"
Cons: Don't see any so far! Summary: The Messiah Matrix combines mystery, intrigue, and history in a compelling look at one key question: Who was the historical Jesus and how does this affect faith? The answer to that question will impact a priest, archaeologist with implications for the Catholic Church. "You don't understand! It was Holy Mother Church that paid me!" "David looked genuinely confused. "So was Constantine pagan or Christian?" "How come the name "Jesus Christ," in fact, doesn't appear in any Greek or Latin author until after the Council of Nicaea?" Do we really know how much of history is truth and how much is slanted in favor of those who wrote it? The Messiah Matrix by Kenneth John Atchity is an intense and riveting thriller that will leave you breathless at the end as historical secrets from the past are uncovered, threatening to expose powerful religious beliefs, doctrines and secrets as heavily veiled lies designed to protect the Church in Rome. At the bottom of the tangled webs of deceit may lay the answer to who is the real Christian Savior. Will centuries of believers rest in the knowledge that Jesus IS the Christian Messiah, or will the real answer come from ancient Rome, centuries before his birth? Two people from completely different backgrounds will risk their lives to expose the answer, no matter what it is. Kenneth John Atchity takes historical facts and contemporary fiction and pieces them together to create a fast-paced mystery/thriller whose roots took hold long ago, but are unearthed with the discovery of a single coin. Pairing a newly ordained Jesuit Priest with a young and brilliant archaeologist, Mr. Atchity deftly creates two perspectives that come together well in the quest for hidden truths with richly detailed scenes, including "flashbacks" to ancient times, in supposition of what machinations were contrived for the history books. Will some find this book a little uncomfortable? Possibly, but this is a work of fiction, based partially on historical facts and manipulations. I believe the author intends to cause the reader to invest themselves enough in this book to question whether history is always exact. One does not have to believe all that is written, but to consider that there is more intrigue in the world than often thinks and there always has been. If you are looking for a book that will make you think outside of the box, almost creating your own "subplots" or "what ifs," The Messiah Matrix could be that book you're looking for! I'd like to thank Kenneth John Atchity for providing me with this review copy in exchange for my honest review. Dii. The Messiah Matrix... better than the DaVinci Code reviewers agree! A renowned scholar-monsignor is killed in Rome while a Roman coin is recovered from a wreck off the coast of ancient Judea. It's up to his young American protégé--a Jesuit priest--and a vivacious, brilliant archaeologist to connect these seemingly disparate events and unravel the tapestry that conceals in plain view the greatest mystery in the ecclesiastical world. Together they pursue their passion for truth—while fighting to control their passion for each other. What they uncover is an ancient Roman imperial stratagem so controversial the Curia fears it could undermine the very foundations of the Roman Catholic faith--much like the secrets emerging from the Vatican in today's news. From the ancient port of Caesarea to Rome's legendary catacombs and the sacred caves of Cumae, this contemporary novel follows their exhilarating quest to uncover the truth about the historical existence of the real "Christian Savior." Classical scholar and Yale Ph.D. Dr. Kenneth John Atchity is the only author alive today capable of creating this literary and historically-based spellbinder. I got this book during a recent free promotion and I have to say I really did enjoy this book. I loved the presentation of the conflict material, the characters were well developed and there is enough mystery, action and romance to make this book an enjoyable read. I guess Religious Mystery would be a good way to describe the genre of this book. The author has gone into detail to establish some believable research to reinforce his mystery novel and as I read the book I kept thinking this was where Dan Brown's books would go if he stepped outside the Jesus bubble and took religion to the next level. I loved the "investigative process" the characters went through. And the material provided by the author made the presentation believable. Which is what you need to support the rest of the story plot. Because, if you can't believe the theory presented by the characters about religion and Christianity, then the actions taken by the religious institutions become absurd. Characters are well played - we have a Jesuit priest, F. Ryan McKeon, who thought he had his world exactly as he wanted it till he meets the lovely Emily, the archeologist who finds the key to bringing down the entire Christian faith. The story spins their world totally out of control with Vatican plots, crazed Jesuit leaders and the collected research of Fr. McKeon's murdered mentor. The book kept me turning the pages, following the research and nodding my head as I examined the evidence with Fr. McKeon. And the suspense as Emily and Ryan team up and are chased all over Italy - well, the romance was expected but Fr. McKeon keeps you guessing. 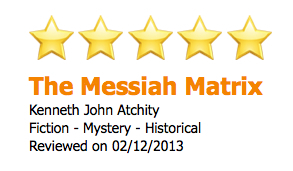 Upon first viewing the title and cover of The Messiah Matrix by Kenneth John Atchity, my curiosity was certainly piqued. My mind instantly ran to a familiar literary bestseller, The Da Vinci Code. Of course, keeping comfortably to that frame of thought would have been quite an injustice. As the book commences on a wholly vicious murder of a monsignor, the reader is thrown into the inner litany of Father Ryan McKeown's confusion and profound revelation.
" 'The monsignor said,' he gasped, 'Find Father Ryan... memory in the ashes of Jasius...in the Gesu.' Then the man's eyes closed as he breathed his last and made his way to the eternal gates that Ryan's absolution may or may not have opened for him." "Not only was he wrestling with the shock of dual murders but Ryan's doubts about his faith now consumed his every waking moment and haunted his nights. It was mind versus spirit..."
Enter Emily Scelba, an archaeologist who joins Father Ryan in his quest for answers. From the death of Monsignor Isaac to the strangely evolving discoveries within the gaping questions about religion and faith, there is a certain aura of determination in the danger laden journey of the main characters. "He made his way through the labyrinth of shaded arcades and near-hidden passageways, so intent on his destination that nothing else fazed him." Atchity has woven a brilliant story meshing the divergent lives of various characters within the fabric of this riveting novel. His careful approach in delineating the complex and, oftentimes, turbulent aspects of human nature are indicative of his immense writing skills. There is nothing leisurely about this book. From the first sentence to the end of the last page, the reader is filled with an intense need to fill the subsequent divide that appears within the vivid narration of the story. The deft skill utilized in displaying the tangible sense of danger, the need for certain knowledge, and the question of faith, evokes the same emotions within the reader. Kenneth John Atchity was a professor of literature and classics at Occidental College in Los Angeles 1970-87. He also represented writers of both fiction and non-fiction, accounting for numerous bestsellers and movies he produced for both television and big screen. He has drawn on his expert knowledge of Christian history and his classical training to write The Messiah Matrix. If it weren't for the continuing interest in the wickedness of the Catholic Church and the on-going variety of plots imagined, we would be forced to find another perpetual villain. Fortunately for those of us who enjoy a good thriller with romance thrown in, the never-ending variety of writers' imaginations keeps giving us new ones. Then we have Father Ryan McKeown, S.J., the tousled brown-haired priest (a Jesuit—in a bit of rather timely choice), who is in his cassock and life of celibacy somewhat reluctantly. He is drawn into a rapidly escalating plot of murder, Vatican politics, and danger. When he meets Emily after the one man they both knew turns up dead, the road to a solution to the many problems presented becomes rocky indeed. Make no mistake about this book; it's a well-written thriller with a deep secret which would shock the world. Although at this point in history, nothing the Vatican or the Catholic Church does shocks all that much. Emily and Ryan try to stay one step ahead of the bad guys. It's hard to tell who that is and it seems to depend on the mood of the day. Ryan struggles with his crisis of faith and his attraction to Emily. She moans to herself that the sexiest man she has met in years is a man who has sworn his life to his order and to a life of celibacy. Thankfully, the author does not descend to prurient tastes and manages to escalate the sexual tension without resorting to anything other than the sins of thought and withheld desire. Although the two are trapped once (more than once) and do end up in each other's arms exchanging a smoldering kiss. Much to their individual dismay. The introduction of historical facts is covered rather slickly by having Emily tell the skeptic Father Ryan all the "facts" in the form of stories. Emily herself went to a school taught by Jesuits, but has long since left the church. She has a great deal of historical knowledge which continues to shock Ryan. The plot proceeds at a good pace right down to the last chapters. The ending struck me as contrived, and the stretch when the secret is revealed is almost too unbelievable to consider. But that's from one who also left the church. Those first eight grades in Parochial Catholic School leave an indelible mark. The newly published fiction novel, The Messiah Matrix by Kenneth John Atchity is a unique hybrid of a detective story, history, and religious fantasy tale in one story. Atchity serves up a large dose of religious conspiracy theory to satisfy the discriminating tastes of even the most paranoid, staunch atheist reader. The author goes into extensive detail describing a fictitious, yet well woven quasi-historical theory of the origins of the Roman Catholic Church and Jesus. In fact, the same readers that actually believed Dan Brown's intricate tales of church intrigue and conspiracy theories in the fictional novel, The Da Vinci Code, may be the very same gullible readers who may believe that Atchity's tale is in fact true. Because of its realism, I would advise impressionable individuals to pass this novel up as they may be easily led to believe it is true. Yet, this imaginative tale far exceeds the talents of the popular Dan Brown novel [emboldening by site ed.] with its insertion of authentic historical details and the unique, and unexpected climactic end. I was quite surprised at the imagination of Atchity. This fictional work can almost be deemed a clever attempt to re-write ancient history and undermine the authenticity of the biblical gospel and new testament. At minimum this book calls into question the authority and the credibility of the Christian church, and more specifically, the Roman Catholic Church. The inclusion of authentic and relevant details intertwined with fictional details, make this a clever piece of deception and this work may leave the uneducated reader who is less grounded in history, second guessing what he thinks he knows about ancient history and religion. Nominally religious readers may find they lose their faith altogether. The insertion of a look a like "Imprimatur" on the book's spine may mislead some Catholic readers into thinking this is a religious book sanctioned by the church. I am fairly certain the bait and switch attempt to draw in the religious audience is not the author's intent. The ancient Catholic symbol of the Chi-Ro within the text, Latin phrases and the illustrations of actual ancient Roman coinage as well as fictionalized false coinage all serve to complete an aura of authenticity in selling this alternate "historical" reality to the reader. I feel that the author's biases against organized religion- specifically the Catholic church is obvious in the writing details. For example, any reference to a Catholic sacrament included additional opinion as to its efficacy. For example as early as page 11, the author's opinion is introduced when he calls into questions the last rights offered by the priest in the statement that the absolution "may or may not have opened" the eternal gates. In otherwords, Atchity second guesses the effectiveness of the sacraments. Some religious Catholic readers who catch these subtle insults to their faith might take offense. The appendix or chart in the back of the book boldly equates biblical history as "Mythical" history. Actual historical events are set side by side with biblical events that he calls myth. Parallels and connections are made between the divine claims of Jesus with the Roman Caesar. Biblical concepts and spiritual phrases such as the "Keys to the Kingdom", "den of thieves", "loaves and fishes", "hell", "He is risen" and "Son of God" are reinterpreted with new meaning. Literal and practical interpretations replace the biblical, faith based meanings. The implication is that the gospels have been misread and misinterpreted, and there is another non spiritual explanation and that the Catholic church has been responsible for a cover-up fooling even sincere clergy as well as the faithful laymen. Nevertheless, the author is a talented writer, who puts together an intelligently written, researched work of fiction that will be sure to engage even the most educated reader. The extent of factual historical information might lose some modern day readers. Yet I feel the detailed historical elements adds to its value and richness as it transports the reader to ancient Rome. It is not surprising to learn that Atchity is a college professor. To give details as to the actual storyline and the historical scenario presented, would surely spoil the book's surprise for those who wish to read it. Therefore I find I have to cut this review short. It is sufficient to say that the author provides an alternate, non religious, yet interestingly literal interpretation of some faith based elements of biblical history. I can imagine the author bursting with excitement in anticipation as to the reactions of surprise that readers, as well as his professional colleagues - will certainly have when they get to the end of the story. As a blogger, I received a free copy of this book for review published by the Story Merchant and Imprimatur Britannia. I was not required to write a positive review and the ideas expressed are my own. "What if ? " scenario....... Alternate historical scenario (fictitious ancient coin depicts Jesus). Important point to remember- this is a work of fiction. The Hollywood Huckster was known to put the "high" in hijack. Shanghi-ing you to check out the Messiah Matrix would have been easy for Kevin to do. As he would have boasted: "I'd give my left testicle (assuming my right could function for both) to get you to check it out." Well here's to your having the balls to discover and enjoy this great novel. So give it a shot, and if anyone sees you reading it and asks where you heard about it, just tell 'em the Hollywood Huckster sent you. I have for several years held the belief, arrived through observation of commonly known facts, that the Roman Catholic Church was simply an evolution of the Roman Empire, morphed as it were to a new purpose. The Caesars morphed into the Popes, so to speak, with the last vestige of the original empire being the Roman Catholic Church we see today. KJ Atchity's 'The Messiah Matrix' put ample scholarly meat behind my lay observations and pinpoints exactly why and how this evolution took place. I have to say that the book, written not as a boring scholarly work but as a riveting thriller, was an astounding wake-up call regarding the origins of Christianity and, moreover, the Cult of Personality that surrounds many religions as they often tend to separate people into spiritual camps rather than see them as unique expressions of a single spiritual reality. For at the end of the day, the message of all great spiritual masters is that every human being is capable, individually, of enlightenment and of the 'Christ Consciousness.' This has certainly been the message of the great teachers of the East, including many yogis and saints from India and Tibet. Atchity's engrossing, powerful book lays bare how we need to bring spirituality back to its true purpose and encourage religious institutions to seek common ground centered on individual spiritual potential, not separate us based on the 'rightness' of a particular view. Bravo Ken Atchity for your courage and intelligence! Why did the Catholic Church keep its common followers illiterate for over 1000 years while Jews had virtually 100% literacy? Because anyone who reads about the origins of Christianity will see the Jesus myth for what it is: a simple distillation of earlier pagan beliefs. The academic credentials of Ken Atchity are impeccable and the pagan precursors of Christianity he describes are recognized by all serious scholars, yet completely unknown to the vast majority of Christians. A Christian reading this book will have to face some difficult truths. Some will prefer to voluntarily choose the ignorance Catholicism forced on their illiterate ancestors. But if faith is too weak to flourish in the light of reality, what is it worth? Matrix also exposes the intense rivalry between the main body of the Catholic Church and its most powerful order, the Jesuits. If you doubt the power of the Jesuits, take a look at today's news. A Pope resigns for the first time in six centuries and guess who the new Pope is? A Jesuit for the first time ever. Quite a coincidence - or not. Reading Matrix will make it clear that these two events must be intimately related..
A book that reveals crucially significant yet relatively unknown ancient history even as it provides insight into today's headlines is rare if not unique. Messiah Matrix does exactly that in the context of an engrossing thriller and a touching love story. It may be the most important and is certainly among the most exciting novels of our time. I give it five stars. "The Messiah Matrix" by Kenneth John Atchity sweeps the reader right into the action as a Jesuit priest is run down in the middle of a street in Rome. The driver of the three-wheeled truck is horrified when he realizes that his victim is wearing a Roman collar and cannot understand why the church would have ordered this assassination. The dying man asks him to deliver a cryptic message to another priest, Father Ryan, and the driver fulfills that wish. Meanwhile, Emily, an archaeological iconographer, has discovered a rare gold coin in a wreck off the Palestinian coast, which is stolen on the orders of a Church functionary. Emily and Father Ryan are thrown together in a search for the coin and the answers to why the church ordered Monsignor Isaac's murder and exactly what it is trying to conceal. I enjoyed every minute I spent reading "The Messiah Matrix". There's action and adventure as well as a fascinating look into ancient church history. Monsignor Isaac's research is revealed piece by piece by Emily, who had been his correspondent, in the form of stories from the past. "The Messiah Matrix" keeps the reader putting together the pieces of the puzzle along with Emily and Father Ryan. I found myself wondering how the story would be resolved and really got involved -- something I truly enjoy and all-too-rarely experience when reading. Atchity has written a fun, exciting and informative book in "The Messiah Matrix," and I'm looking forward to reading more from this author. "The Messiah Matrix" by author Kenneth Atchity is well-written with a clever plotline that Dan Brown fans will absolutely adore. The characters are all well-developed and believable, with realistic and interesting dialogue that keeps you turning the pages. Readers who can tolerate a theme of religious variation will absolutely love "The Messiah Matrix." With its key elements of religious intrigue in the form of revelations about the history of Christianity and an associated interesting artifact, this book, The Messiah Matrix by Ken Atchity, can't fail to be compared to Dan Brown's Da Vinci Code. And it compares extremely favorably. This is an impressive piece of writing that keeps you engrossed from start to finish, with suspense, adventure and romance, as it challenges traditional religious views. A man who has killed a priest confesses his sin to Father Ryan, but very soon after is himself murdered. Father Ryan sees the act and as he gives the man the last rites, the murderer gives him a message that sends him off a hunt to discover the origins of Christianity. He crosses paths with archaeologist Emily Scelba, an intelligent, feisty archaeologist in charge of an underwater excavation, unearths a Roman coin, the Augustan aureus, that is evidence that the generally perceived version of Christianity is incorrect. This valuable artifact is stolen by a duplicitous friend. Ryan and Scelba team up to track it down. They're not natural allies and so it turns into a fascinating partnership for the reader to follow. Where Emily is outgoing and decisive, Ryan is anxious, cautious, introspective. The action moves between the present and the past. All the settings are vivid and the historical ones bear evidence to an immense amount of research by the author. The characters, despite the speed at which they seem to be constantly moving much of the time in this breathless adventure, have depth and complexity. There are occasional pauses when some of the theological discussion slows down the book's pace and give us plenty to think about. The book is certainly controversial and that's refreshing and rewarding. The chart of events at the back of the book, drawn up by Ryan and Emily, that juxtaposes actual history with mythical/biblical history, that closes the book is an inspired touch. This is a precisely and intricately woven novel, expertly crafted and an absolute must-read. "The Messiah Matrix" is a brave novel that threatens to destroy a Christian myth. After a scholar-monsignor is killed in a mysterious hit and run accident in Rome, Father Ryan receives a confession that will change his life forever. At the same time, in a wreck off the coast of ancient Judea, Emily, a young archaeologist discovers an old coin that will become the key evidence that will challenge the Catholic Church's beliefs. What follows is a series of events that will bring these two people together. They will seek the truth together starting from the old port of Caesaria to the catacombs of Rome. And in the course of this journey, they will also fall in love with each other. "The Messiah Matrix" is a novel that may subvert the foundation of the Catholic Church itself. Dr. Kenneth John Atchity has succeeded in writing an intriguing novel that will make the reader think twice about the identity of Jesus Christ. Action starts on the first page and the reader is sucked in as the suspense grows throughout the novel. Passionate about the truth, the characters of Father Ryan and Emily are both interesting and compelling. The narrative goes on in an exhilarating pace that left me breathless. Atchity knows his subject and cleverly weaves an interesting story around it. Being a Classical scholar and a Yale Ph. D graduate, it is a given that he has done his research. Coming up with this intense and action packed novel just shows his versatility. Peppered with historical facts, "The Messiah Matrix" may well make us question our accepted belief on the identity of the son of God himself. Emily Scelba, an archaeologist, uncovers an old Roman coin from time of Emperor Augustus. She sends it to a museum for authentication, only to be told it was stolen. Father Ryan McKeown witnesses the death of Bishop Isaac, whose dying words reveal a secret to be revealed. Emily and Ryan literally bump into each other in Rome, both looking to unravel Isaac's secret. This leads them through Roman catacombs, entanglement with the Jesuits [...] They reveal to the world the true basis of Christian religion, to the consternation of the faithful. With 'The Messiah Matrix', Kenneth Atchity takes the reader into a fast paced journey of ancient intrigue--history most people don't know exists and may not want to hear--and a struggle for power and personal discovery. Atchity brings a wealth of research into the book and combines it with professional writing that kept me turning the pages. If you want to know an alternate origin of Christianity, this is the book for you.